Whether you are a new collector or you just want to update your information you may wonder, "How do I find the value of an antique toy train?" There are several steps involved in finding the value of your antique train. Each is important to the final value. You should understand that if it is important for you to get a very accurate evaluation of you train, for insurance purposes for example, then you should take it to an appraiser that is experienced in antique and vintage trains. While you can get a good idea of the estimated value of your train by doing some research, it will be a ballpark figure only. The first step in finding the value of your train is to identify it. Toy trains did not run on tracks until 1881. Prior to that time the trains had wheels and the child would push it along the floor, much like a toy car of today. A good identification guide is always your best friend when it comes to identifying almost anything. You can usually find them at your local library. If your branch doesn't have a guide, then ask the librarian about an interlibrary loan. This may take a few weeks but save you money in the long run. 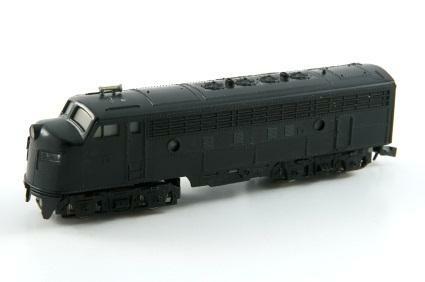 Most people won't use an identification guide for toy trains more than once or twice. If you are unable to get one from the library Amazon has several such guides for less than $20.00. One of the main ways that antique toy trains are identified is the gauge. This is the term that refers to the width of the track, measured across the inner edges of the rails. Standard gauge is 2 1/8-inches across and was popular in the United States through the early 1900s up to the Depression and World War II. During the Depression the tracks were made smaller as a cost effective way to continue producing the trains. This gauge was 1 ¼-inches. Rarity sometimes does help determine the value of a train but not always. Some items are rare but because collectors really aren't interested in them they don't have much value either. Train collectors, perhaps more than any other collector, have a definite set of likes and dislikes that helps to set the value of the items that they collect. These brands command top values at auction even if they are not that old. Condition always plays an important part in evaluation of any antique or collectible. Train sets that have all of the parts and pieces intact will almost always sell for more than sets that don't. If there are a lot of highly detailed graphics and they are in good condition the train's worth will be increased. On the other had if there is a lot of wear and tear on the paint, scratches, dents, or rust the train will be worth much less. You should also do as much Internet research as possible. Going to websites like eBay and entering the search term for your particular train should yield a number of items in a variety of conditions. You can look at both current auctions and those that have ended to get an idea of what collectors are paying for your item. Another excellent resource is e-Interchange, a site for toy train collectors to buy, sell, and talk about their collections. While you are attempting to answer the question, "How do I find the value of an antique toy train?" you should get more than one opinion and check more than one resource. By using identification and price guides that are up to date, checking current auctions, and talking to other collectors you can get a good idea of what you have and what it might be worth.